Blog — Sklar | Handmade Bicycle Frames. Mountain, Cyclocross bikes built to order. The best cyclocross bike is one that can be used to race in the fall, but is also a great all arounder for gravel grinding, road riding, training and general shenanigans the rest of the year. This custom cyclocross frameset is just that. 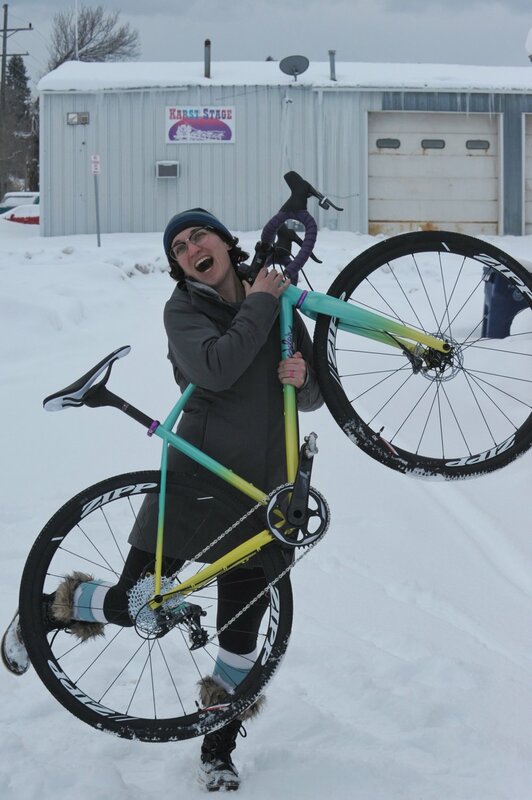 Susan walked into the shop this summer and placed a deposit for a new cross bike. I was psyched because as unbelievable as it may seem, I do not get to build all that many bikes for local customers here in our small mountain town of Bozeman, MT. Anyhow, we got to talk bikes, take measurements and design this rad bike for Susan, who at 5'3" has always had a little trouble fitting on a stock bike. Being a local, it was also great to get to ride together on the Alter Tuesday night shop rides and later at our weekly cross series. Fast forward a few months and Susan's bike was ready! A fresh coat of liquid paint sets the frame off. Gotta love the fade. I delivered the frame to Susan and she did a beautiful job building it up with parts from our friends at White Industries, SRAM, Zipp and more. This bike is so rad and I can't wait to see it out on the dirt, road or wherever else it may go! I'm sure it's going to crush at the cross races next fall. Happy riding Susan!